As a pediatric occupational therapist and a mother, I try my best to fully understand each child and his/her sensory needs, both at home and in my practice. Children living with Autism Spectrum Disorder (ASD) or Sensory Processing Disorder (SPD) tend to experience sensory overload or adverse reactions to sensory input more frequently than typically developing children. In addition, toddlers and young children do not have fully integrated sensory systems and may experience sensory overload more often than older children. As a result, these children have a greater tendency to move from PNS (parasympathetic nervous system response, a calm and alert state) to SNS (sympathetic nervous system response, a fight or flight state) in the presence of certain sensory stimuli. These children may perceive sensory input that seems “normal” or “routine” to adults as overwhelming or even painful. This explains why they often experience a fight or flight (sometimes known as a meltdown or an adrenaline response) in the presence of these sensory stimuli. Each child is very different in terms of the type or amount of sensory input that causes this reaction. Many children living with autism or SPD have a hard time with self-regulation — which makes matters even more difficult, since they need assistance to calm. As parents and caregivers, we need to recognize when a child is having a “fight or flight reaction” (sensory overload or meltdown), and most importantly, pinpoint what triggered it. Children who are experiencing fight or flight may attempt to escape the situation or hide, they may become aggressive, or they may cry/scream inconsolably. There are other indications of a fight or flight response as well: some kiddos may shut down or fall asleep. This reaction is often unique to the individual. We need to remember that responding from a behavioral point of view is ineffective in these cases. As adults, we need to remove the excessive or adverse stimuli, and we may need to take the child to a calm, quiet place. Some children may need to be held, while others may prefer to sit alone with a blanket or a pillow. Some children may like the lighting low while soft music is played, while others may prefer to sit with a fidget of some kind. In addition, attempting to reason with a child during sensory overload is ineffective. Be a calm presence and try to talk only when the child is ready. Proprioceptive sensory input can often be calming because it provides us with information about where our body is in space (proprioceptive input is also known as deep pressure input— beanbag chairs, large or weighted stuffed animals, joint compressions, lotion massage, etc. all provide this type of sensory input). When having a meltdown or experiencing sensory overload, proprioceptive input helps to decrease over-responsiveness to other types of sensory input. It works in part by encouraging the production of serotonin, a modulator of the central nervous system. Proprioceptive input is often referred to as the body’s natural tranquilizer because of this regulatory effect. In other words, proprioception helps to counteract the “noxious” stimuli that the child was unable to effectively process. Certain types of vestibular sensory input (sometimes referred to as movement input) can also be calming. However, vestibular input can also be alerting. In general, slow rhythmic movement is calming while fast movements with stops and starts are alerting. Some children who are in the midst of a sensory meltdown respond positively to swinging on a swing or rocking in a chair, while other children prefer to bounce on a yoga ball or jump on a trampoline in times of stress. 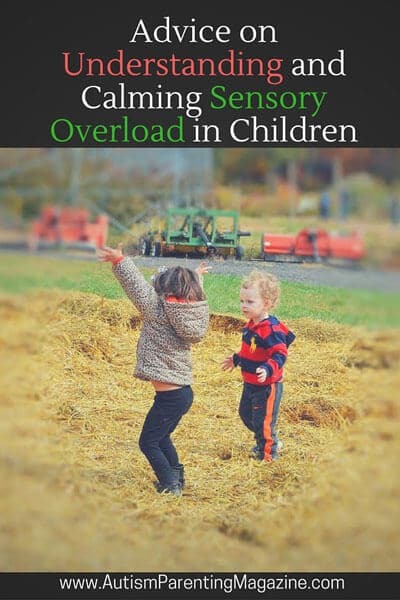 It is important to have a basic understanding of sensory input that is calming to your child (as each child has an individual response to sensory input) before trying any of these activities. Always talk to your child’s pediatrician and/or occupational therapist before trying any new sensory activities. If you would like to learn more about occupational therapy and childhood development, check out www.babyot.com or like us on Facebook www.facebook.com/babyotsensory. Kimberly Z. Syers is a Pediatric Occupational Therapist and the mother to a two-year-old little boy. She has her BA in Psychology and her MS in Occupational Therapy from Kean University. Kimberly works exclusively in Early Intervention with infants, toddlers, and children 0-3 years of age. She is the founder of www.babyot.com, a website and blog for parents, caregivers, and practitioners to learn about Occupational Therapy, sensory integration, and childhood development. She is also the creator of BabyOT on Facebook, a community for parents and practitioners to ask questions and learn more about Early Intervention and Occupational Therapy. Kimberly is in the process of writing a parenting book on a sensory approach to managing meltdowns and other challenging behaviors in toddlers and young children. Follow her on Facebook https://www.facebook.com/babyotsensory/ to join in on the fun! Happy New Year! Thanks for sharing !God bless and more power!